How to Cite This Chapter: Verdu EF, Szajewska H. Celiac Disease. McMaster Textbook of Internal Medicine. Kraków: Medycyna Praktyczna. https://empendium.com/mcmtextbook/chapter/B31.II.4.10 Accessed April 24, 2019. Rubio-Tapia A, Hill ID, Kelly CP, Calderwood AH, Murray JA; American College of Gastroenterology. ACG clinical guidelines: diagnosis and management of celiac disease. Am J Gastroenterol. 2013 May;108(5):656-76; quiz 677. doi: 10.1038/ajg.2013.79. Epub 2013 Apr 23. PubMed PMID: 23609613; PubMed Central PMCID: PMC3706994. Bai JC, Fried M, Corazza GR, et al; World Gastroenterology Organization. World Gastroenterology Organisation global guidelines on celiac disease. J Clin Gastroenterol. 2013 Feb;47(2):121-6. doi: 10.1097/MCG.0b013e31827a6f83. PubMed PMID: 23314668. Ludvigsson JF, Leffler DA, Bai JC, et al. The Oslo definitions for coeliac disease and related terms. Gut. 2013 Jan;62(1):43-52. doi: 10.1136/gutjnl-2011-301346. 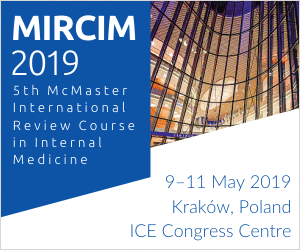 PubMed PMID: 22345659; PubMed Central PMCID: PMC3440559. Giersiepen K, Lelgemann M, Stuhldreher N, et al; ESPGHAN Working Group on Coeliac Disease Diagnosis. Accuracy of diagnostic antibody tests for coeliac disease in children: summary of an evidence report. J Pediatr Gastroenterol Nutr. 2012 Feb;54(2):229-41. doi: 10.1097/MPG.0b013e318216f2e5. Review. PubMed PMID: 22266486. Husby S, Koletzko S, Korponay-Szabó IR, et al; ESPGHAN Working Group on Coeliac Disease Diagnosis; ESPGHAN Gastroenterology Committee; European Society for Pediatric Gastroenterology, Hepatology, and Nutrition. European Society for Pediatric Gastroenterology, Hepatology, and Nutrition guidelines for the diagnosis of coeliac disease. J Pediatr Gastroenterol Nutr. 2012 Jan;54(1):136-60. doi: 10.1097/MPG.0b013e31821a23d0. Erratum in: J Pediatr Gastroenterol Nutr. 2012 Apr;54(4):572. PubMed PMID: 22197856. Celiac disease is an autoimmune enteropathy triggered by gluten and developing in patients that carry the HLA-DQ2 or HLA-DQ8 haplotype. Gluten is the collective name for a group of proteins in wheat (gliadins and glutenins), rye (secalin), and barley (hordein), all of which can trigger celiac disease in a genetically susceptible host. Gluten proteins have a high concentration of the amino acids proline and glutamine, rendering them resistant to enzymatic degradation by digestive enzymes. As a result, large, potentially immunogenic peptides may reach the mucosa of the small intestine and initiate an immune response. The high proline and glutamine content in gluten peptides also renders them excellent substrates for tissue transglutaminase type 2 (tTG2). tTG2 is a ubiquitous intracellular enzyme that is released extracellularly and activated during inflammation. Once this occurs, tTG2 deamidates gluten peptides, which converts glutamine to negatively charged glutamic acid residues, increasing their binding affinity to HLA-DQ2 and HLA-DQ8 molecules on antigen-presenting cells. Gluten-specific T cells from patients with celiac disease preferentially recognize deamidated gluten peptides and produce the type 1 helper T cell (Th1) cytokines interferon gamma and interleukin 21. Gluten-specific Th1 cells also provide help for the activation of B cells to form antigluten and anti-tTG2-producing plasma cells. The presence of antibodies to tTG2 (anti-tTG2 IgA) or endomysial antibodies (EmAs) and/or IgA or IgG antibodies against deamidated forms of gliadin peptides (DGP-AGA) is a valuable tool for diagnosing celiac disease. In clinical practice, IgA antibodies to tTG2 along with total IgA levels to exclude IgA deficiency are the primary serologic diagnostic tests used. Contrary to what was previously thought, onset of celiac disease occurs at any age, and today the disease is more often diagnosed in adulthood. Although ~30% of the world population carries the HLA-DQ2 or HLA-DQ8 genes, only 1% will develop the disease. This together with the rising prevalence of celiac disease in the past 40 years suggests that unknown environmental factors may also play a role in disease pathogenesis. 1) Gastrointestinal: Chronic diarrhea, abdominal pain, recurrent aphthous stomatitis, vomiting, symptoms compatible with irritable bowel syndrome, constipation, micronutrient deficiencies, steatohepatitis, weight loss (rare). 2) Cutaneous: Dermatitis herpetiformis (Duhring disease) (Figure 1). 3) Hematopoietic: Iron deficiency anemia. 4) Urogenital: Delayed puberty (including delayed menarche). 5) Central nervous system: Seizures, migraine, depression, ataxia. 6) Other: Muscle weakness, tetany, short stature, dental enamel defects. 2. Clinical classification of celiac disease: Table 1. 1) Gastrointestinal: Pharyngeal or esophageal cancer, lymphoma or cancer of the small intestine, refractory celiac disease (symptoms persist despite compliance with a gluten-free diet). 2) Hematopoietic: Non-Hodgkin lymphoma, hyposplenism. 3) Urogenital: Infertility, recurrent miscarriage, premature birth, premature menopause. 4) Musculoskeletal: Osteoporosis and osteomalacia. Diagnostic tests should be preceded by ≥6 weeks of daily intake of ≥1 meals containing gluten. 1) Iron deficiency anemia (a frequent abnormality in adults), rarely megaloblastic anemia. 2) Reduced serum levels of iron, folic acid, calcium, vitamin D.
3) Hypoalbuminemia (due to protein loss into the gastrointestinal tract). 2. Specific serology: IgA antibodies to tTG2 (total IgA levels must also be measured to exclude IgA deficiency) with sensitivities ≥90% and specificities ≥95%.Evidence 1Moderate Quality of Evidence (moderate confidence that we know true effects of the intervention). Quality of Evidence lowered due to heterogeneity. Giersiepen K, Lelgemann M, Stuhldreher N, et al; ESPGHAN Working Group on Coeliac Disease Diagnosis. Accuracy of diagnostic antibody tests for coeliac disease in children: summary of an evidence report. J Pediatr Gastroenterol Nutr. 2012 Feb;54(2):229-41. doi: 10.1097/MPG.0b013e318216f2e5. Review. PubMed PMID: 22266486. EmAs are used to confirm tTG2 results but are not available in all centers. In patients with IgA deficiency, IgG antibodies to tTG2 or DGP-AGA need to be measured. 1) Screening of patients with suspected celiac disease (to assess the indications for biopsy of the small intestine). 2) Screening in high-risk groups (eg, family members of patients with diagnosed celiac disease; patients with related autoimmune diseases, such as type 1 diabetes mellitus). 3) Monitoring of compliance with a gluten-free diet. 3. Endoscopy: Grooved or scalloped margins of duodenal folds, reduction in the number of folds (which are flattened or atrophic), a mosaic pattern of the mucosal surface, and prominent submucosal blood vessels (normally not visible). 4. Histologic examination of samples of the small intestinal mucosa is key for the diagnosis of celiac disease, particularly in adult patients. The European Society for Paediatric Gastroenterology Hepatology and Nutrition criteria propose specific clinical situations where biopsy could be avoided in the diagnosis of celiac disease in children. The tissue samples (≥4 biopsies collected from different sites) are usually obtained by esophagogastroduodenoscopy from the distal duodenum. A typical histologic finding is villous atrophy accompanied by high intraepithelial lymphocyte counts and hyperplasia of intestinal crypts. 5. Genetic testing: The absence of HLA-DQ2 or HLA-DQ8 molecules excludes the diagnosis of celiac disease. Positive serologic study results and typical histologic findings. General diagnostic algorithm: Figure 2. Differential diagnosis should include other causes of enteropathy (villous atrophy): chronic giardiasis, tropical sprue, protein malnutrition, anorexia nervosa, food hypersensitivity (the lesions are usually focal), viral infection (including human immunodeficiency virus [see AIDS]), bacterial infection (eg, tuberculosis), bacterial overgrowth syndrome, Whipple disease, postirradiation complications, immunodeficiency (eg, hypogammaglobulinemia, common variable immunodeficiency), Crohn disease, ulcerative colitis, and lymphoma of the small intestine. 1. Gluten-free diet: Lifelong elimination of all wheat, rye, and barley products. Products allowed: Dairy products (liquid and powdered milk, hard cheese, cottage cheese, cream, eggs); all meats and meat products (note: diced bread and semolina may be added to certain meat products such as sausages, pates, liverwurst), offal (liver, lungs, kidneys), fish; all fruits and vegetables; nuts; rice, corn, soybeans, tapioca, buckwheat; all fats; sugar, honey; spices, salt, and pepper; coffee, tea, cocoa; gluten-free breads, cakes, and desserts. All gluten-free products are labeled with a crossed-grain symbol. Products not allowed: Wheat, rye, barley, and oat products; bread rolls, white bread, whole-grain bread, crispbread; pasta; semolina, barley, and oat groats; oatmeal; products containing gluten, such as cakes, biscuits, confectionery, and others. Supplementation of iron, folic acid, calcium, and sometimes vitamin B12 may be indicated (in case of deficiency). Repeated monitoring of the effectiveness of treatment includes evaluation of the diet and nutritional status of the patient. Undetectable levels of EmAs and antibodies to tTG2 are an indirect confirmation of compliance with gluten-free diet. 2. Immunosuppressive drugs (eg, glucocorticoids, azathioprine, cyclosporine [INN ciclosporin]) may be used in refractory celiac disease not responding to dietary restrictions. 3. Treatment difficulties and future pharmacologic therapies: Very small amounts of gluten (50 mg or a breadcrumb) can induce villous to crypt abnormalities in celiac patients. Without proper monitoring, following a gluten-free diet can lead to nutritional deficiencies. The diet is also expensive. Incomplete clinical and mucosal recovery has been reported in patients following a strict gluten-free diet to the best of their abilities for up to 5 years. Noncompliance, either voluntary or through inadvertent contamination, is common. This highlights the need for development of adjuvant therapies to the gluten-free diet. Several approaches are being pursued, such as use of permeability modulators and enzymatic supplements with enzymes from microbial origin that fully digest gluten (currently in phase IIb and phase III of clinical testing). CD, celiac disease; EMA, endomysial antibody; tTG2, tissue transglutaminase type 2. Figure 1. Dermatitis herpetiformis (Duhring disease). Figure 2. 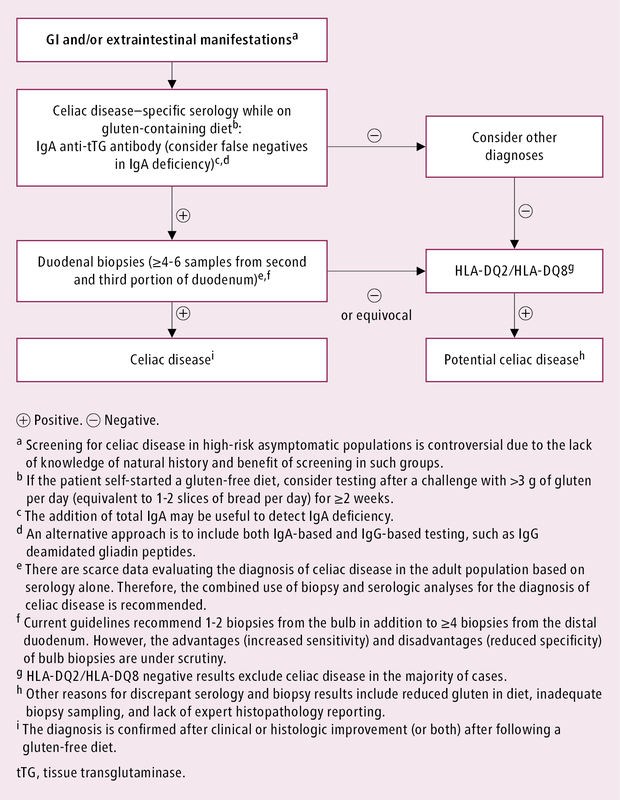 Diagnostic algorithm for adult patients with suspected celiac disease. Based on the 2013 American College of Gastroenterology guidelines (see Additional Information for details).